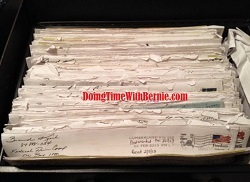 DoingTimeWithBernie.com: Why do felon Bernard Kerik’s best friends keep “intentionally creating space” with him? Why do felon Bernard Kerik’s best friends keep “intentionally creating space” with him? Why do felon Bernard Kerik’s best friends keep “intentionally creating space” with him? Rudy Giuliani, Joe Tacopina, a slew of mistresses, a few ex-wives, former co-workers and I, have all, as felon liar Bernard Kerik describes, felt it necessary to “intentionally create space” between ourselves and Bernie Kerik. It’s a sad, recurring theme in Bernard Kerik’s life. • Bernard Kerik relied on his good friend/attorney/business partner, Joe Tacopina back in the day. But when Joe Tacopina was pressured not to lie to the FEDS, Bernie “intentionally created space” by defaming and suing this once “loyal” friend and attorney.